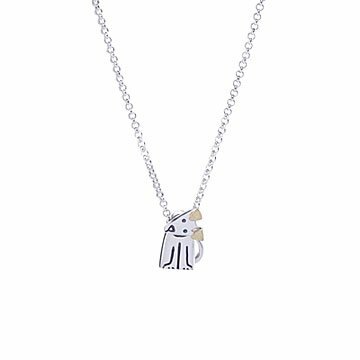 Alan Ardiff celebrates our canine companions' ability to listen with this dog pendant that tilts its head. Pup parents agree: When you need someone to pour your heart out to, no one's a better listener than a canine companion. Alan Ardiff captures the attentive nod of a loving dog in his sterling silver moving pendant. Using miniature gears and a delicate touch, he gives each adorable puppy a head that moves as you turn your own neck. The friendly little guy even has 18-karat gold ears, for a little extra shimmer each time his head tilts. Wear it in honor of your own pooch, or give one to thank your (human) best friend for always listening. Handmade in Dublin, Ireland. “I have been daydreaming most of my life, creating work that is wondrous, sometimes wise, but always heartwarming,” says Alan Ardiff, who designs and crafts his imaginative jewelry in Dublin, Ireland. It started in college when he was told to see his art as a vehicle for expression. From that day forward, all his designs featured wheels and cogs. By using tiny moving pieces, Alan is able to bring his jewelry to life. Or rather, the wearer is, each time they move and activate the miniature mechanisms Alan’s placed within his little sculptures. Since every piece is a work of art, it’s given a title and packaged in a picture-frame like box, then labeled by the artist himself. .5" L x .4" W x .3" H Chain: 18"
Wipe down gently soft cloth. Beautifully Crafted and exceeded my expectations! This necklace is not only unique, the quality is amazing. The head tilts when I move my head just like our dog Ella's head would tilt when she was trying to figure out what we were saying to her. Good Listener is the perfect name for this necklace. It has exceeded my expectations in every way! This is the most amazing replica of my Australian Shepherd! I will never take it off!